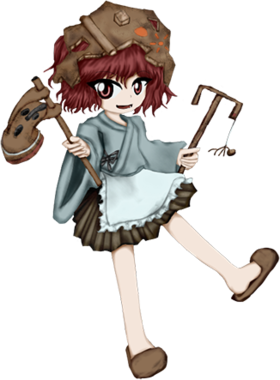 Sukune Katano (片埜　宿禰, Katano Sukune) is a friendly yet quirky haniwa youkai that is famed as a talented artisan. They're the stage 5 boss and final stage midboss of Earthen Miraculous Sword, as well as a playable character in Reactivate Majestical Imperial and Brilliant Pagoda or Haze Castle. They're JynX's favorite character. Sukune has an energetic, positive personality, yet they're also a bit eccentric. They talk in a weird speech that they have invented themself for the sake of being creative, adding lots of verbal tics to their speech, such as "gyuu" and "nyo". Sukune is also described as a kindhearted simpleton by many people. Despite being a talented artisan, they're secretly displeased with their creations. Because of it, they're easily manipulated by Adagumo no Yaorochi to transfer the essence of the Tasouken into a clay model. They despise people not appreciating art or not being taken seriously. They attack the protagonist in Earthen Miraculous Sword in a fit of despair when they comment that they don't care about art or find their creations uninteresting. They're displeased with everyone finding their home to have an eccentric design (it's a haniwa-shaped house). Despite Sukune being a light drinker who rarely drinks alcohol, they really love to open sake bottles. If you drink together with them, they'll say that they won't drink, but they'll end up "opening" a whole ton of sake bottles, and be warned that you'll be left "emptying" most of them by yourself. Plus, they usually carry around a staff that includes a bottle opener. They also like to put bottle openers in their creations, even to clay pots or weapons. Yaorochi realizes too late when in the end of Earthen Miraculous Sword, Sukune puts a bottle opener in the Tasouken. Sukune can form dirt into any shape without using any tools. However, because they're so skilled at crafting shapes, they end up creating any shape they imagine in a flash, so the affection and emotional attachment for the object, as well as the artisan, weren't there. Sukune believes their creations to be empty on the outside, not even realizing that they were such perfect vessels for housing divine spirits, such as the Tasouken. In Reactivate Majestical Imperial, they're shown creating sculptures from ice. One day, Adagumo no Saragimaru requested Sukune to make a clay sword similar to the Tasouken, but afraid of Adagumo no Yaorochi's rejection, they never went to pick it up. Yaorochi found the clay sword anyway and was entranced by it. It was then that Yaorochi feigned to be a holy servant. They lied and said that they were able to make any object house a spirit. At the prospect of their creations becoming "complete", the haniwa immediately agreed without asking the orochi about their motives. And so, Yaorochi of course chose the sword to borrow. They couldn't actually make anything house a spirit just to transfer the energy of the original Tasouken into the clay sword. In order to transfer the soul without losing it's power, they required a "vessel". And so as a place to perform the ritual Yaorochi had Sukune prepare a huge clay "vessel". While Yaorochi prepared the ritual, they asked Sukune to wait outside, not wanting the haniwa to notice the lie. Outside, the sky was enveloped by gathering clouds, so the heroes went to fight against them in order to stop the cloudy weather. Their character may be an homage to Alice Margatroid . Both create dolls and their biggest wish is to create an automate doll. 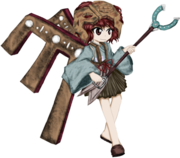 Also, Sukune's shot-type is probably based on Marisa Kirisame -A's shot-type in Subterranean Animism in which a no-focused shot is stronger than a focused shot, but a focused shot has more range. Their full name is Sukune Katano (片埜　宿禰). Their given name Sukune (宿禰) literally means "dwelling in an ancestral shrine". It's also an archaic for a "lord", an honorific title of respect for nobility, as well as the third highest of the eight hereditary titles, designated by Emperor Tenmu in 684 CE. However, it may be a reference to Nomi no Sukune, who is regarded as the creator of sumo. Their family name Katano (片埜) is an actual name in Japanese that literally means "one side of the field", and may be a reference to a shrine of the same name. Sukune is shown to be short in height. They have short red hair and red eyes. They dress in a blue kimono and a brown hakama with an apron. They often wear clay ornaments, such as a clay helmet (as seen in all their appearances) and even clay wings. Sukune was tricked by Adagumo no Yaorochi into transferring the essence of the Tasouken into a clay sword, but said process made the weather in Mugenri very cloudy. Sukune didn't pay much mind to it, believing the clouds to be a secondary effect of the ritual. The heroes enter into the Ritual Chamber created by Sukune. The haniwa themselves uses their power to mold everything around the chamber in order to stop them, because they didn't want for their creations to be empty again. After Yaorochi is defeated, the Tasouken attacks on its own because the essence of the Tasouken was too strong for Sukune's clay vessel. After everything was cleared, Sukune reveals to them that the back of the sword acts as a bottle opener. The orochi was devastated at first, but in the end they decided that they didn't mind at all because they had the sword in their possession after centuries and it was all that mattered to them. Meanwhile Sukune invites Yaorochi and the heroes to a sake party. There's a long winter out of season and there is a sudden flow of spirits. This bothers Yaorochi and Sukune, who want to find out who's responsible for it. They go to the Senri Shrine for answers, but after finding nothing, they decide which team will resolve the incident and be the first team to know why. Since Sukune has lived in Mugenri for long, they're acquainted with most native humans and knows how the system works. After dealing with a few youkai in search for answers, they arrive at the Frost Cavern, where they bump into Kuroji Shitodo and Adagumo no Saragimaru. The latter doesn't want Yaorochi to recognize them, so Kuroji helps them into concealing. Offended after Sukune casually mentions their money problem, Kuroji attacks them and forces Saragimaru as well. After defeating them, they continue their way, where they find Taira no Fumikado, who was trying to collect spirits for their resurrection ceremony, since they want to resucitate the vengeful spirit Taira no Masakado and store him in their homunculus body. After defeating them, they find out that all the spirits are attracted to a certain location. Finally, they end up in the Withered Grove, where they find the chimera soul Shion, who is the avatar of the soul-eater flower Harujion and was absorbing spirits causing a long winter. Sukune realizes that the heroes were supposed to uproot the Harujion before it bloomed, but since the priest Tsurubami Senri is in the Outside World, it has bloomed. Deciding to do the right thing, the heroes fight them in a duel. In the end, Yaorochi and Sukune arrive at the Senri Shrine, bringing Shion with them. Shion indicated that they were attracted by the essence of the shrine and stays there. It's revealed that the spirits came to Mugenri because of a hole in the Mugenri Barrier that separates the land from the Outside World. The hole was caused by Lumen, during the Clouds Incident and Tenkai Zuifeng was tasked to repair the hole, but is taking too long. Angry for putting Mugenri at risk, Yaorochi and Sukune go to chastise Tenkai. After finding out that Tenkai is actually an apprentice, Yaorochi mocks them, only for Tenkai to remind them about the failed Tasouken ritual. On the way back home, they are ambushed by Sese Kitsugai, a youkai they had defeated at the beginning of the story. Sese absorbs the spirits the heroes had been recollecting. After Sese is defeated, the spirits leave Sese's body. Tenkai Zuifeng is worried about the upcoming war between the Dragonfly Army and the Imperials. They go to warn Yabusame and Tsubakura about it, but the two were already gone. On the way to the shrine, Tenkai encounters Sukune and Sese Kitsugai, who were plotting revenge on Yabusame and Tsubakura, and now they want Tenkai to help them. The barrier builder finds themself dragged by the two youkai around Mugenri, as they find out more about the war and what caused it. In all routes, it's revealed that Tsurubami and Tenkai were either feared, hated or respected due to being the dictators of Mugenri and their immense power. Sukune doesn't understand much about what's going on and just attacks any person they consider "bad". At the end of the Brilliant Pagoda or Haze Castle routes, Sukune and Sese don't care much about the war between the Dragonfly Army and the Imperials. In the end, they meet Suzumi Kuzu, the one responsible for the words about the "The mirror of Heaven shall split" in order to lure Tsubakura. Suzumi reveals their intention to make Tsubakura's life a living hell and after a hard fight, Suzumi erases their memories again (with Tenkai being the only one who vaguely remembers). As an artisan, Sukune is very sociable and knows a lot of people around Mugenri. During the events of Earthen Miraculous Sword, Yaorochi manipulated Sukune into transferring the essence of the Tasouken into a clay sword (requested by Saragimaru to make Yaorochi happy) by posing as a holy servant. Despite caring about nothing but the sword and willing to hurt and manipulate people for its sake, Yaorochi did feel guilt about using Sukune. Even after discovering that Sukune revealed that said clay sword was actually a bottle opener, the two became good friends and Yaorochi forgave Sukune for the misunderstanding. 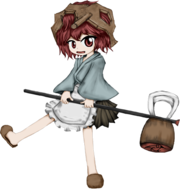 Yaorochi is a loner by nature who despises humans and weak youkai, but is friends with Sukune and after the clouds incident, both live together in Sukune's house. Despite Yaorochi's immense power, dialogue with Yabusame imply that Sukune is the more dominant in their relationship and Yaorochi acts mild towards the haniwa. Sukune is one of the few Mugenri natives who doesn't fear or hate Tenkai for being one of the dictators of Mugenri. Both are in cordial terms and Sukune looks up to the barrier builder because of their strength. In Brilliant Pagoda or Haze Castle, it's revealed that Sukune and their peer group had the habit to nickname them the "Melon of Death" due to their clothing's color combined with their abilities. Like many other, Sukune doesn't really think Tsubakura and Yabusame are doing their job as Senri Shrine priests, by being inclined towards doing things as they please instead of doing it the traditional way. Despite that and antagonizing them a few times, Sukune is still in cordial terms with Tsubakura and Yabusame and visits them at the Senri Shrine. Saragimaru is the one who requested Sukune to transfer the essence of the Tasouken to a clay sword in order to make Yaorochi happy. Sukune can't remember Saragimaru's face or name and doesn't know about them being Yaorochi's sibling. Both are acquitances from the Capital City. Sukune and Sese became friends after the events of Reactivate Majestical Imperial. Both teamed up in order to defeat Tsubakura and Yabusame once. Illustration of Sukune on TwitPic. ↑ A reference to the story Kachi-kachi Yama. ↑ Likely a reference to Sonic the Hedgehog. ↑ Herokaruusu is an area in Hokkaido. ↑ A variation on Sukune's final card in Earthen Miraculous Sword. ↑ A variation on Yaorochi's fourth card in Earthen Miraculous Sword. ↑ Doguu (弩偶): pun on doguu (土偶, figures) and do or ooyumi (弩), which means "crossbow". "弩" is also used in the superlative "弩級/ド級" ("do-level"), which originated as a shortening of "dreadnought-level" referring to dreadnought boats. ↑ Reference to Shion's card "Id=Es". This page was last edited on 13 November 2018, at 09:47.